Regular visitors to Notinhalloffame.com might have noticed that we have been working on the top fifty players of each North American franchise. We are continuing this with the look at our second NFL franchise, the Buffalo Bills. The Buffalo Bills are the only team in NFL history to make the Super Bowl four times. Granted, the team from Western New York lost on all four occasions but over time the accomplishments involved to get there are celebrated more and more. At present, this list reflects accomplishments up to the end of the 2015 season. The list is based on traditional metrics advanced metrics, length of service, popularity, and post season performance. Which team are we working on next? We will turn our attention to the diamond and the Washington Nationals. 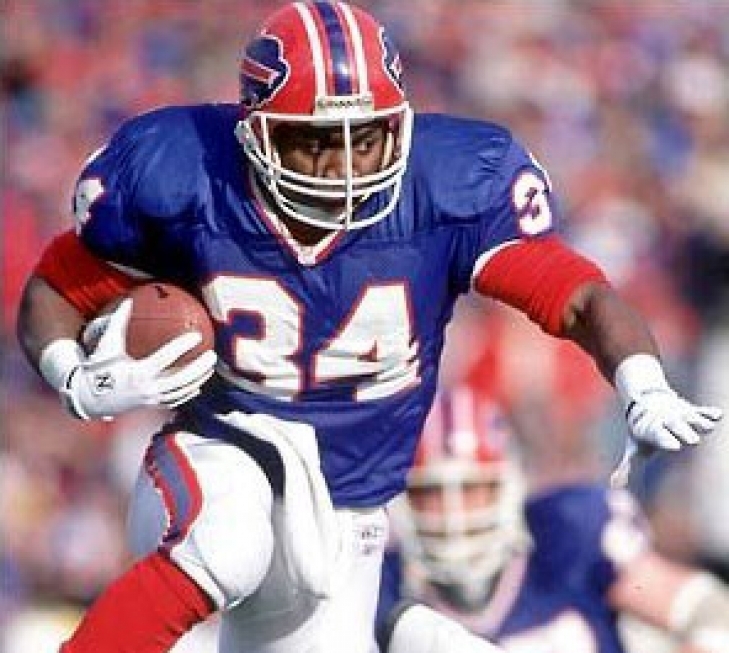 As such, it is important to us that the Buffalo Bills have announced that they will be retiring the number 34 of Thurman Thomas. Thomas was a vital part of the AFC juggernaut that went to four straight Super Bowls from 1990 to 1993. A five time Pro Bowl and two-time First Team All Pro Selection, Thomas rushed for 11,938 Yards with 65 Touchdowns for Buffalo and he would add another 4,341 Yards Receiving with 22 Touchdown Receptions. From 1989 to 1992, he would be the league leader in Yards From Scrimmage. Thomas was named the league MVP in 1991 and e was chosen for the Pro Football Hall of Fame in 2007. Thomas becomes the third player to have his number retired by the Bills. He joins fellow teammates Jim Kelly (12) and Bruce Smith (78). We here at Notinhalloffame.com would like to congratulate Thurman Thomas on receiving this prestigious honor. 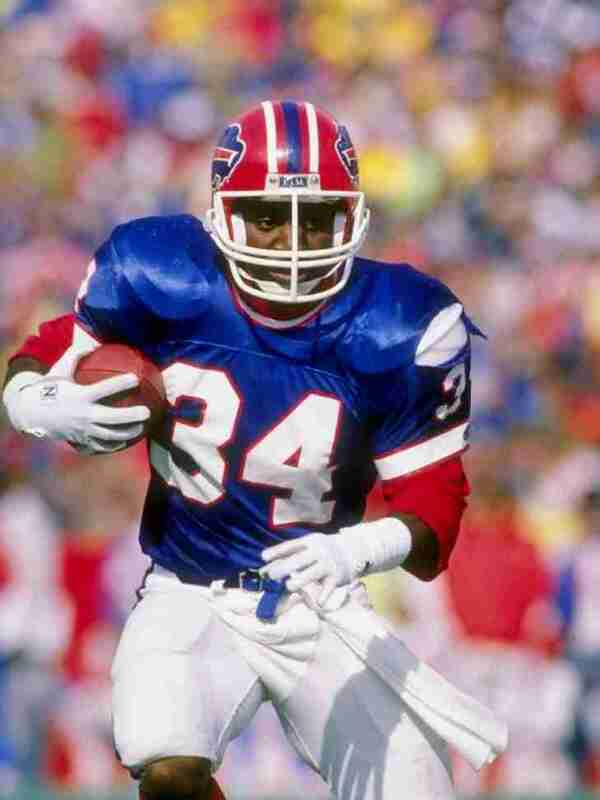 As such, for us to note that last night during halftime of the Buffalo Bills home loss to the New England Patriots that the number 34 of Thurman Thomas was retired. Along with Jim Kelly and Andre Reed, Thomas was the running portion of a potent Bills offense that went to four straight Super Bowls. The Running Back would play 12 seasons for Buffalo and was named a Pro Bowler from 1989 to 1993 and was a First Team All Pro in 1990 & 1991. He would also lead the league in Yards from Scrimmage every season from 1989 to 1992 and was named the AP MVP and Offensive Player of the Year in 1991. As a Bill he rushed for 11,938 Yards, received 4,341 more Yards and had 87 Touchdowns. This marks the third time the Buffalo Bills retired a number. Jim Kelly’s #12 was retired in 2001 and Bruce Smith’s #78 was retired in 2016. Thomas was inducted into the Pro Football Hall of Fame in 2007. We here at Notinhalloffame.com would like to congratulate Thurman Thomas for earning this very impressive honor. Generally if you are selected to eight Pro Bowls in a decade regardless of your position it stands to reason that you won’t be forgotten. Somehow, Lemar Parrish managed to slip through the cracks of football consciousness as his legacy just doesn’t seem as big as it should be. You can’t be selected to eight Pro Bowls in eleven years without being consistent. Parrish was certainly that, but while he was a top Cornerback, he was also a top Punt Returner for the first half of his career. Once he stopped returning punts, Parrish would actually have some of his best years at Cornerback as he landed his only First Team All Pro selection at the age of 32. Did we make a mistake not ranking Drew Bledsoe in his first year of eligibility? Statistically speaking we may have as his career statistics are more impressive than other Quarterbacks ranked higher than him. However other intangibles come into play which just makes it so hard for us to determine the perfect place for him on this list. Steve Tasker may have been listed as a Wide Receiver but with only 51 career receptions it is hard to think of him as a successful wide out. Tasker did however make the Prow Bowl but it was not because of his offensive capabilities but from his prowess on the Special Teams.